Out There: The Birds! 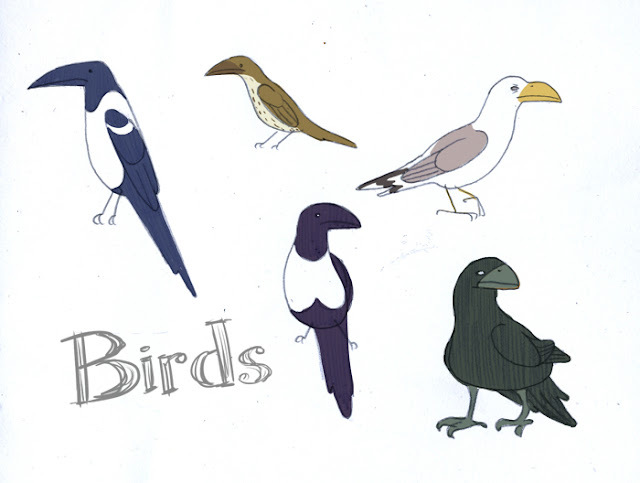 The Birds! I feel like I've not posted any drawings up here for ages... mainly because I've been too busy doing drawings. So while I finish those other drawings, here are some other other drawings just to prove I have been. Drawing, that is. I did these at work when I got bored. Two magpies, one thrush, a gull and what I think was originally a raven but now appears to be some gigantic species of grey duck! I love the slightly dense expression on the magpies' faces, but my favourite is that seagull. Just look at him - pure evil. He's clearly eyeing up some poor innocent's hotdog.